The government of Nigeria has rushed health workers to Daramba, a village on the border with Niger, following an outbreak of whooping cough -- one of the six main killer diseases for children (the others are: diphtheria, measles, polio, tetanus and tuberculosis). Health officials blame villagers who, they say, have shunned routine immunisation. The villagers seem to go by Ibrahim Datti Ahmed, a popular medical doctor in the predominantly Muslim northern state of Kano, who has openly condemned the immunisation programme. 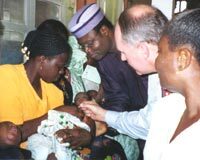 Ahmed, who is also a member of the Supreme Council for Shariah in Nigeria, claims the vaccines contain anti-fertility agents and could also cause aids. About 80 children in Daramba have been infected with whooping cough. This controversy over the safety of the vaccines has also ground to a halt the national polio immunisation programme in Kano, and two other Muslim states in the north of the country -- Zamfara and Kaduna. It is feared that this will further affect the government and un agencies' efforts to eradicate polio by the end of the year. Daramba also has recorded two cases of polio this year.